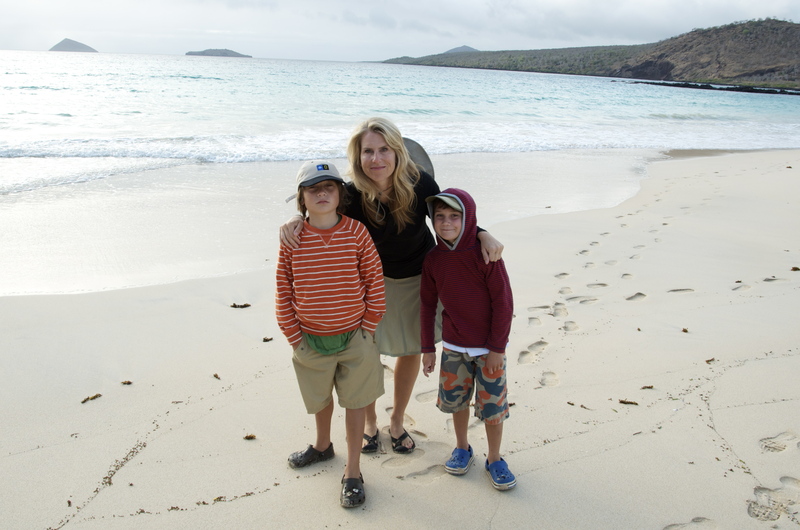 On this isolated beach in the Galapagos, we found hundreds of fragments of plastic. Sad, but a perfect teaching moment. I spend a lot of time in the car with my kids. It’s one of my favorite ways to connect with them because they’re a captive audience. Tonight’s topic of conversation was the state of the planet. What can I say? Sometimes we talk about what’s better — Thor’s hammer or Captain America’s shield? Sometimes we talk about potential flooding from eventual global warming. It all evens out. Tonight’s topic started with a plastic bottle of water in the car. “Remember when we were in Ecuador and we couldn’t drink water from the tap in that nice hotel?” Joe asked. “Well, it was because the water that comes from the tap there isn’t as clean as the water that comes from the tap in our house,” I replied. “Do the Ecuadorians drink their own tap water?” he continued. “I would guess some do. I would guess many others buy bottled water because it’s safer for drinking,” I said, recalling an article I recently read in the New York Times, which stated that residents of Mexico City spend as much as 10% of their income on five-gallon bottles of drinking water because they don’t trust the city’s water supply. “Do you realize,” I continued, “how lucky we are to have such a clean, safe, continuous supply of water delivered to our home day in and day out? Do you remember when we were watching The Amazing Race and the racers were in Tanzania and they saw all those people on line in town to fill up their water bottles for the day? That’s how it is for many people in this world. Not everyone has the luxury of turning on the tap and getting fresh water. Many of them have to go fetch it and bring it home, if they can get it at all,” I told them. “I would hate it if we had to carry water home just to take a shower,” Joe said. “We’re showering in our drinking water?” Joe said incredulously. “Sure. It’s the same water for drinking, bathing, washing dishes, and watering our lawn,” I told him. “That’s stupid,” Joe said. “We should use other water for showering and watering the grass and save the good water for drinking,” he said. Yes! End scene. That’s exactly the thought I was hoping he would get to. At least he showed some glimmer of recognition that safe drinking water is a precious commodity. Will that stop him from taking his 15 minute shower tomorrow morning? Well, that remains to be seen. But, at least it’s in his head now. These teaching moments with my boys are sacred to me. I appreciate when I’m handed the opportunity to remind them how lucky we are and how precious our planet is. When possible, I try to steer our car conversations so they become thought provoking ones. I regularly tell Joe and Luke that they need to be thinking about creating alternative energy sources, cleaning up the gyres in the ocean, and finding new means of getting people clean water because, unfortunately, we still need solutions to the problems that generations before theirs have created and perpetuated yet have not been able to fix. I remind them that they’re the future of the planet. ← Get The Rubber Room Ready For Me! As you say, probably won’t stop that 15-min. shower tomorrow (we’ve got that too, not that any extra washing actually goes on), but the germ of the idea is there. They won’t forget it. I love car conversations. Booyah! Congrats on the Freshly Pressed! Great blog post today! I love these kinds of moments and look forward to sharing them more and more with Jax and Kaylynn as they get older. The boys are at a good age right now and I truly love spending time with them. I finally feel I have a personal relationship with each one of them. It’s wonderful. I’m sure you will find the same as Jax and Kaylynn get older. In the meantime, though, appreciate the snuggles of the little ones. They tend to get less huggy as they get older and more “embarrassed.” LOL. Very good post. I am glad that there are people out there like you who try to teach your sons the importance of good character. We need more people like that in this world. 🙂 Very nice. I love being reminded of the things I take for granted. There are just so many of them. It’s good to remember to be grateful.